Dr. Jane Goodall was born on April 3, 1934, in London, England. From earliest childhood, she was fascinated with animals and the Africa she discovered in the storybooks of Tarzan and Dr. Doolittle. In 1957, she traveled to the Kenyan farm of a friend’s parents and met the famed anthropologist and paleontologist Dr. Louis Leakey. In 1960, at his invitation, she began her landmark study of chimpanzee behavior in what is now Tanzania. Her field research at what was then called Gombe Stream Chimpanzee Reserve--most notably, her discovery that chimpanzees make and use tools--revolutionized the world of primatology and redefined the relationship between humans and animals. In 1977, Dr. Goodall established the Jane Goodall Institute (JGI) to advance her vision and work around the world and for generations to come. JGI continues the work at Gombe Stream Research Center and is a global leader in the effort to protect chimpanzees and their habitats. The Institute is widely recognized for building on Dr. Goodall’s groundbreaking community-centered approach to conservation and development programs in Africa, and for Roots & Shoots, the global environmental and humanitarian youth program. Dr. Goodall founded Roots & Shoots in 1991 with a group of Tanzanian students. The youth program connects more than 150,000 young people in nearly 100 countries, equipping them to take action to make the world a better place for people, animals, and the environment. "Change happens by listening and then starting a dialogue with the people who are doing something you don't believe is right." Dr. Goodall’s eloquent ability to raise public awareness and understanding has become instrumental in her work to save chimpanzees from extinction. She is the author of numerous books that have engaged an international readership in her life with chimpanzees. Her life and work are the subject of numerous television documentaries, as well as the 2002 film "Jane Goodall’s Wild Chimpanzees," and the 2010 documentary "Jane’s Journey." Discovery Channel’s Animal Planet has produced a number of features on Dr. Goodall, including "Jane Goodall’s Return to Gombe," "Jane Goodall’s State of the Great Ape," "When Animals Talk," "Jane Goodall’s Heroes," and "Almost Human." 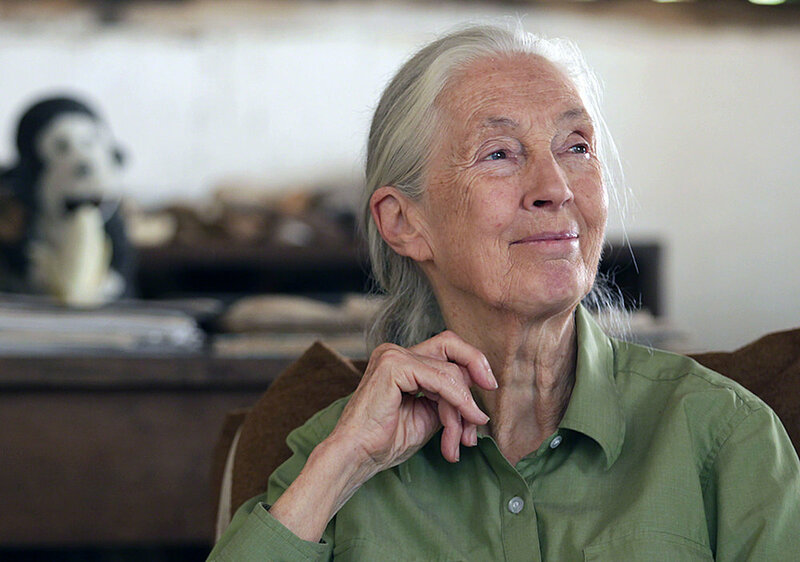 Most recently, the Grammy nominated film "Jane," directed by Brett Morgan, unearthed a treasury of early footage from Dr. Goodall’s early days at Gombe and won international critical acclaim. Dr. Goodall is the recipient of many honors, including the Medal of Tanzania, the National Geographic Society’s Hubbard Medal, Japan’s prestigious Kyoto Prize, the Benjamin Franklin Medal in Life Science, the UNESCO 60th Anniversary Medal, and the Gandhi/King Award for Nonviolence. In April 2002, Secretary General Kofi Annan named Dr. Goodall a United Nations Messenger of Peace. In a 2004 ceremony at Buckingham Palace, she became a Dame Commander of the British Empire. In 2006, she received France’s highest recognition, the Legion of Honor. Dr. Goodall’s published works include the best-selling autobiography Reason for Hope, Hope for Animals and Their World: How Endangered Species are Being Rescued from the Brink, and two overviews of her work at Gombe — In the Shadow of Man and Through a Window. Additionally, she has published two autobiographies in letters and many children’s books, including My Life with the Chimpanzees--a true favorite. The Chimpanzees of Gombe: Patterns of Behavior is the definitive scientific work on chimpanzees and is the culmination of Dr. Goodall’s scientific career. For a more complete list, please visit the Jane Goodall Institute's list of her published books. For more information about the Jane Goodall Institute or to inquire about inviting Dr. Goodall to appear at your event, school or organization, please visit www.janegoodall.org. Nona Gandelman is the literary agent for Dr. Jane Goodall. For publishing or other literary inquiries, please contact her via this form. Thank you. Your message has been received. Nona will get back to you as soon as possible.